16/323 Private Percy Hood, 16th Battalion, the Northumberland Fusiliers was killed in action 1 July 1916 and is buried in Lonsdale Cemetery, Authuile, France. He was 20 years old and is commemorated on Cockfield War Memorial and the Roll of Honour for Cockfield Council School.. In 1911, 15 year old Percy lived at Holly Moor, Cockfield with his grandmother Hannah Hood, his uncle Charles Attwood Hood and his aunt Margaret Attwood Hood. His brothers, 19 year old George and 16 year old Claude also lived there. Charles Hood was a mining engineer. The census does not record if 15 year old Percy was a scholar or at work. Percy Hood enlisted at Newcastle-upon-Tyne into the Northumberland Fusiliers and was given the regimental number 16/323. The service details of Private P. Hood and the war dairy of the 16/Northumberland Fusiliers has not been researched. The 16th (Service) Battalion, the Northumberland Fusiliers was formed in Newcastle in September 1914 and in June 1915 came under orders of the 96th Brigade, 32nd Division. It landed at Boulogne 22 November 1915. Private P. Hood also entered France 22 November 1915. The main line of assault ran nearly 14 miles from Serre to the north to Maricourt to the south with a diversionary attack at Gommecourt 2 miles further to the north. The first objective was to establish a new advanced line on the Montauban to Pozieres Ridge. Adverse weather conditions i.e. the autumn rains and early winter sleet and snow turned the battlefield into morass of mud. Such intolerable physical conditions helped to bring to an end Allied offensive operations after four and a half months of slaughter. The fighting brought no significant breakthrough. Territorial gain was a strip of land approximately 20 miles wide by 6 miles deep but gained at enormous cost. British and Commonwealth forces were calculated to have 419,654 casualties, the dead, wounded and missing of which some 131,000 were dead. French casualties amounted to 204,253. German casualties were estimated between 450,000 to 600,000. In the spring of 1917, the German forces fell back to their newly prepared defences, the Hindenburg Line and there were no further significant engagements in the Somme sector until the Germans mounted their major offensive in March 1918. 29 June: The date fixed for the great attack was postponed for 48 hours. Battalions were ordered to “stand fast”. 30 June: 16/NF moved into its battle position via Martinsart Aveluy Wood and Black Horse Bridge and relieved the 2/Inniskillings at 2.30am. 1 July: 16/NF attack. A Coy led by Capt. A.C. Young to attack from Skinner Street to Hamilton Avenue to Maison Grise; B Coy led by Capt. P.G. Graham. C Coy led by Capt. E. Thompson will be in support in communications trenches with 2 platoons in Hamilton Avenue and 2 in Gourock Street; D Coy led by Lt. Proctor to be reserve in the Second Line Gemmel Trench with Battalion HQ. The battalion stood to for 5 hours until zero hour at 7.30 then goes over the top. 6 officers were killed, 13 wounded and over 350 other ranks were killed. 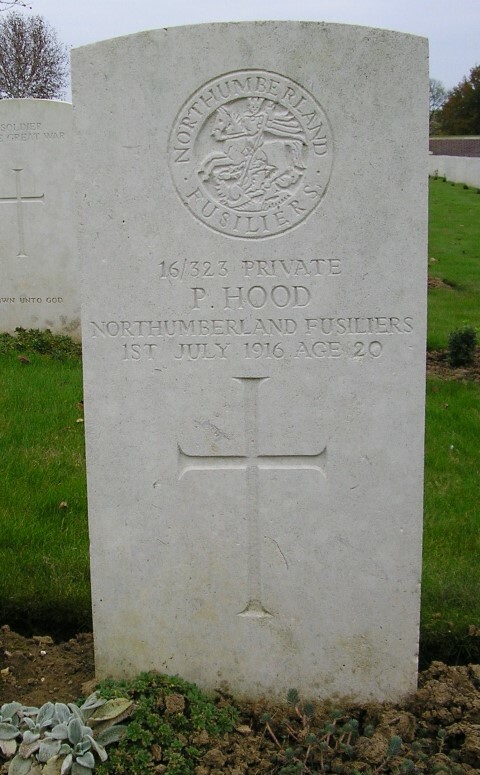 Private P. Hood was killed in action 1 July 1916. The 16/Northumberland Fusiliers lost 5 officers including Captain P.G. Graham and 123 other ranks that day. This figure differs from that given above. Private P. Hood was awarded the 1914-15 Star, the British War and Victory medals. Private P. Hood is buried at grave reference IV.S.10, Lonsdale Cemetery, Authuile, France. Private P. Hood is commemorated on the Cockfield War Memorial and the Roll of Honour, Cockfield Council School. Cockfield Council School Admissions Register Note: It records that John Hood was his parent or guardian.